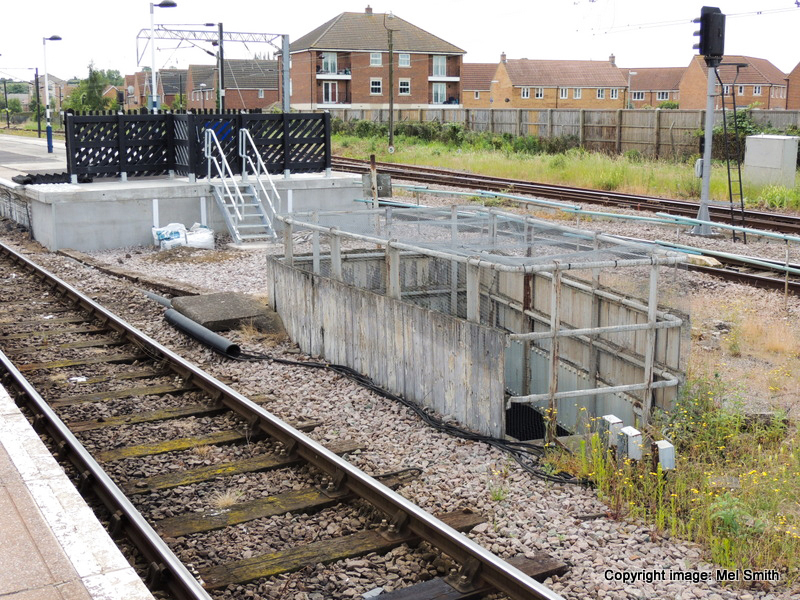 We start this section with a photograph taken at the north end of platform 2 (Down side) before working our way south under the footbridge and on towards the far end of the station. 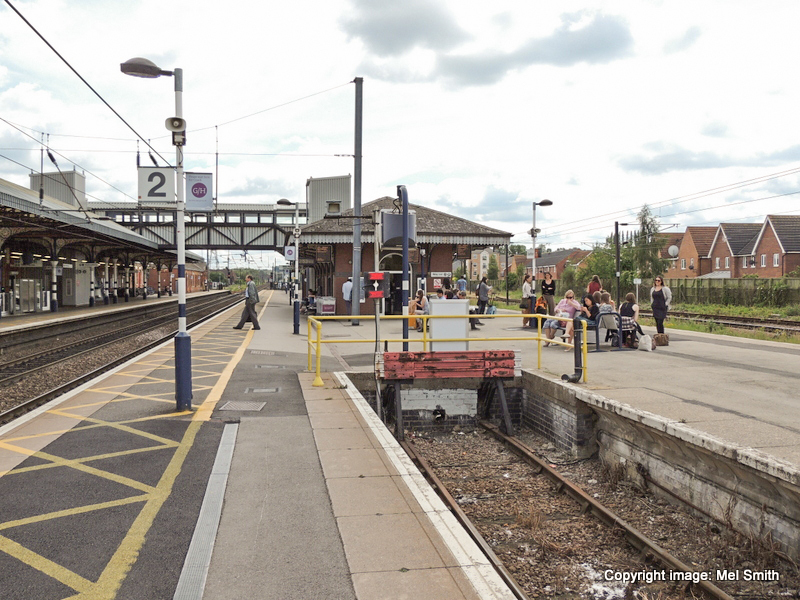 We then return to this same spot via platform 4 seen on the extreme right in the first image. 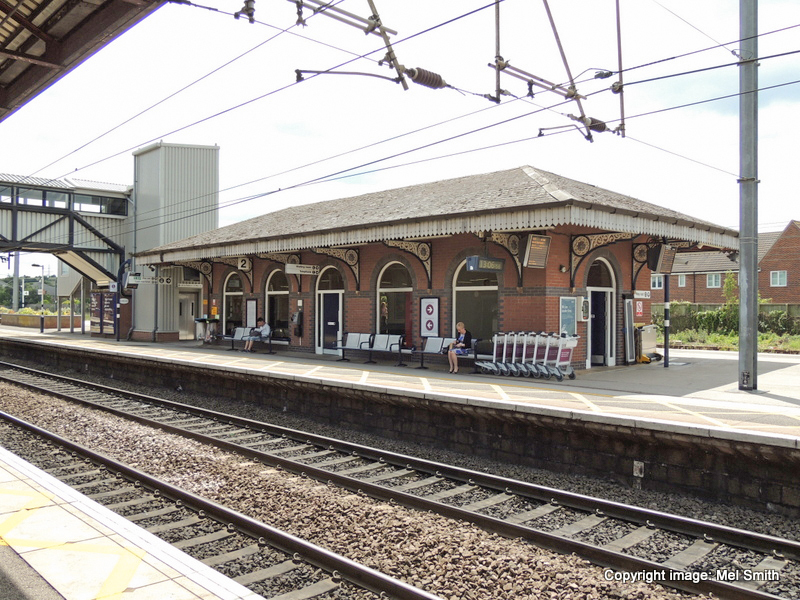 In contrast with the images to be found in our 1970s B&W survey, platform 2 now has only one building, the Waiting Room. 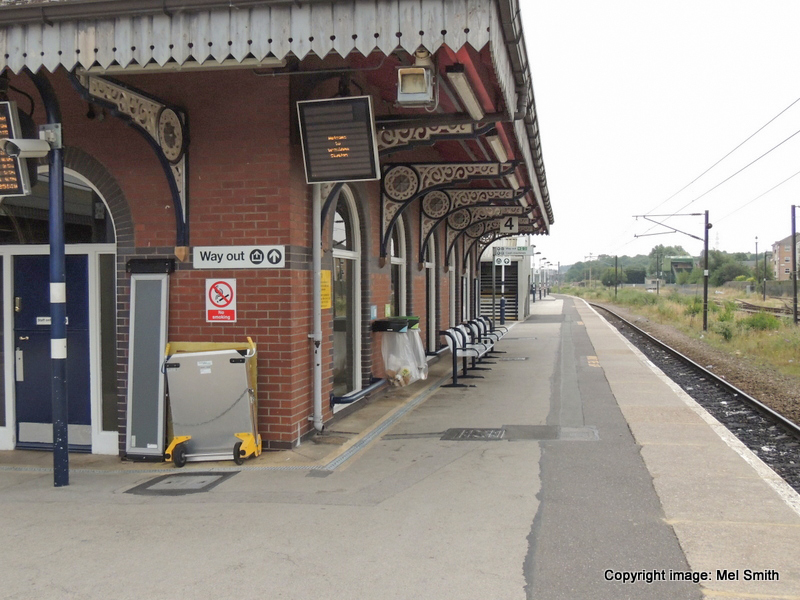 To give a wider perspective some of the photographs of platform 2 were taken from platform 1. Platform 2 looking south with the main lines on the left, the bay in the centre and platform 3 on our far right. Having moved forward a few steps the north elevation of the Waiting Room comes into view. 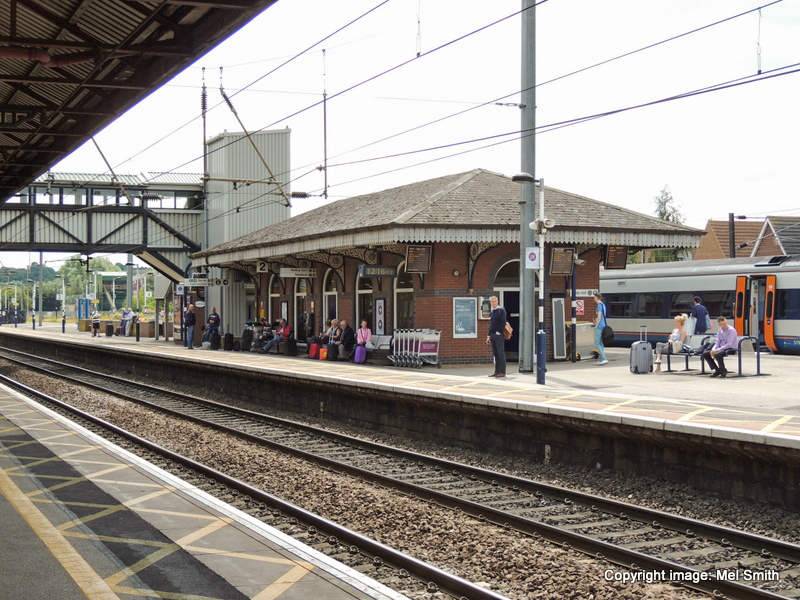 A view across the tracks from platform 1 showing the Waiting Room on platform 2. A closer view of the Waiting Room situated on platform 2. 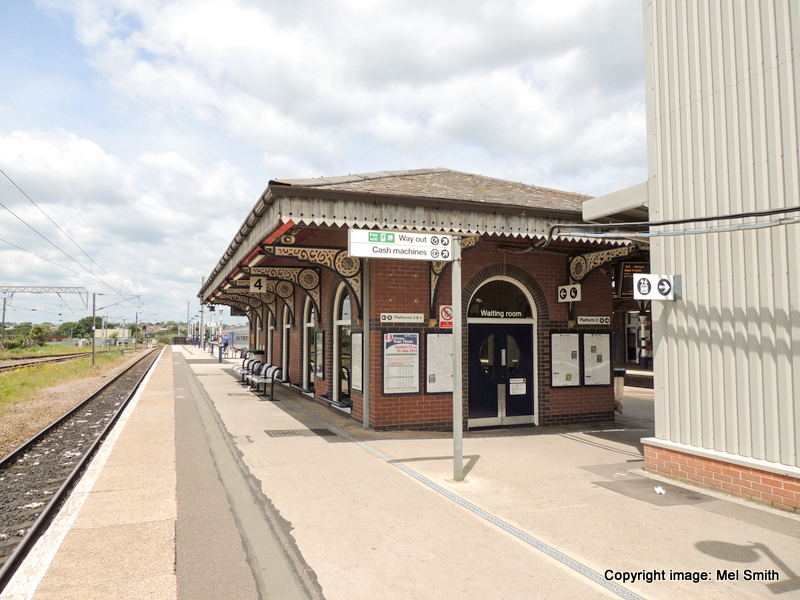 The wooden valance around the edge of the canopy together with the arched windows and doors all create a traditional look to this building; sadly missing from many modern railway stations. 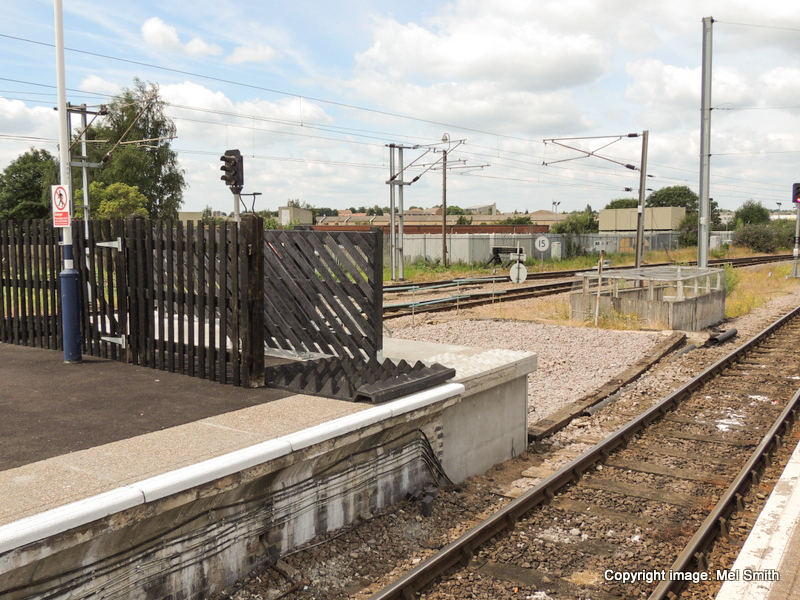 The original ironwork roof supports, recovered during demolition on this platform, were incorporated in the design of the new Waiting Room and thus provide a nice historical blend with the original buildings on platform 1. Having passed under the new footbridge we pause and turn to look back at the Waiting Room on platform 2. 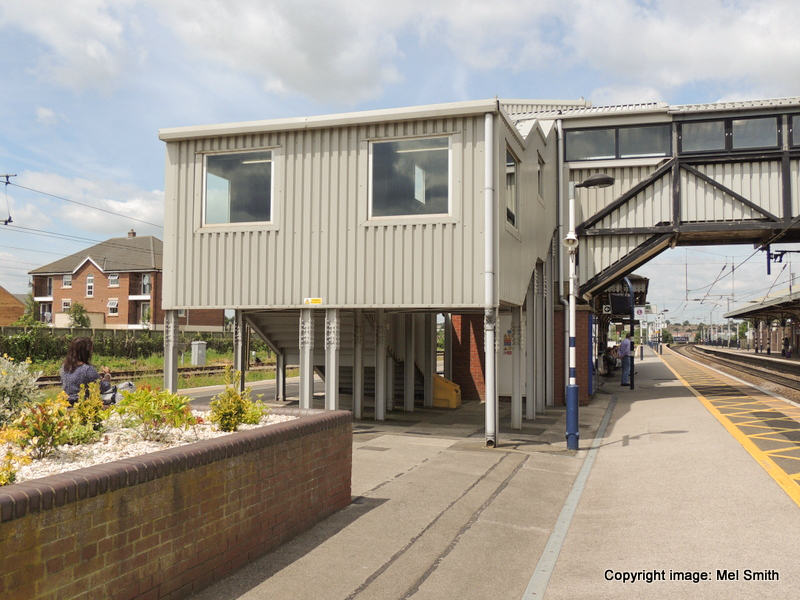 The corrugated clad structure seen between the Waiting Room and the footbridge is a lift shaft. 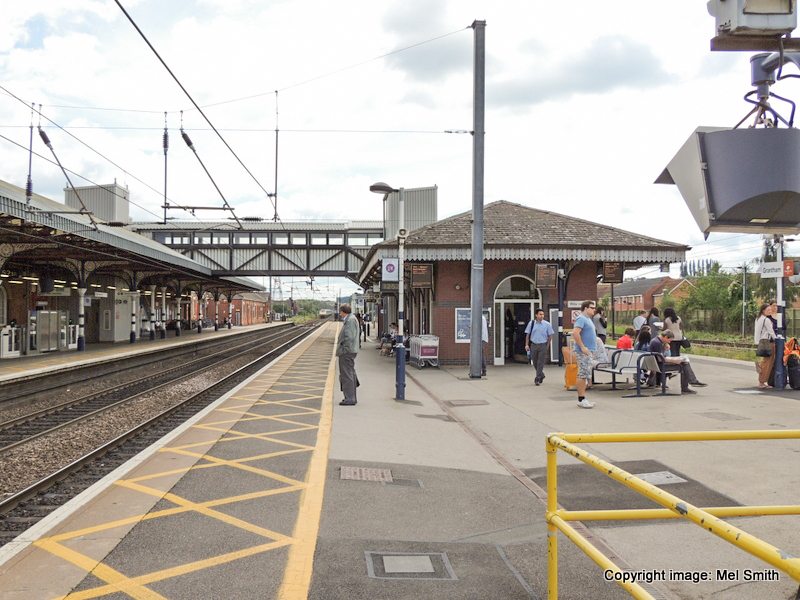 This is the view looking north on platform 2 with the main lines on our right and platform 4 on the far left. 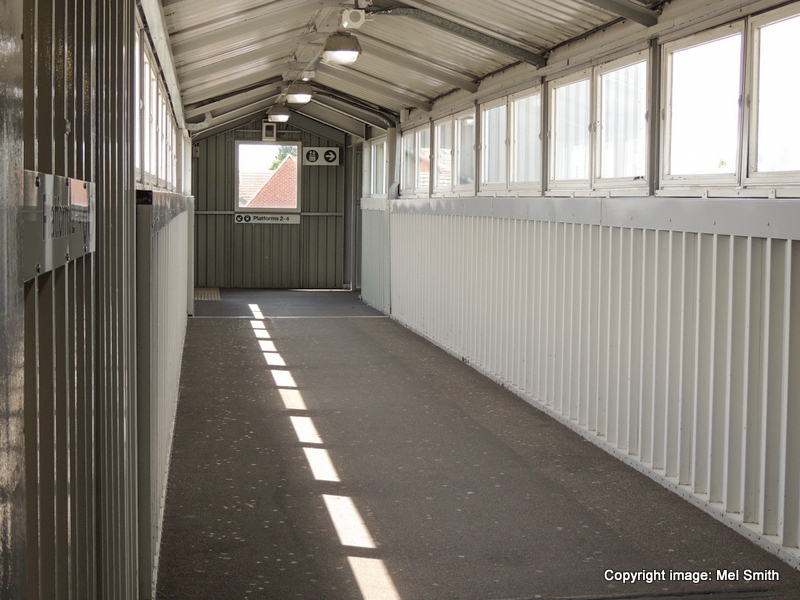 The corrugated clad structure encloses the first landing of the stairway up to the footbridge. The rather sparse environment at the south end of platform 2. 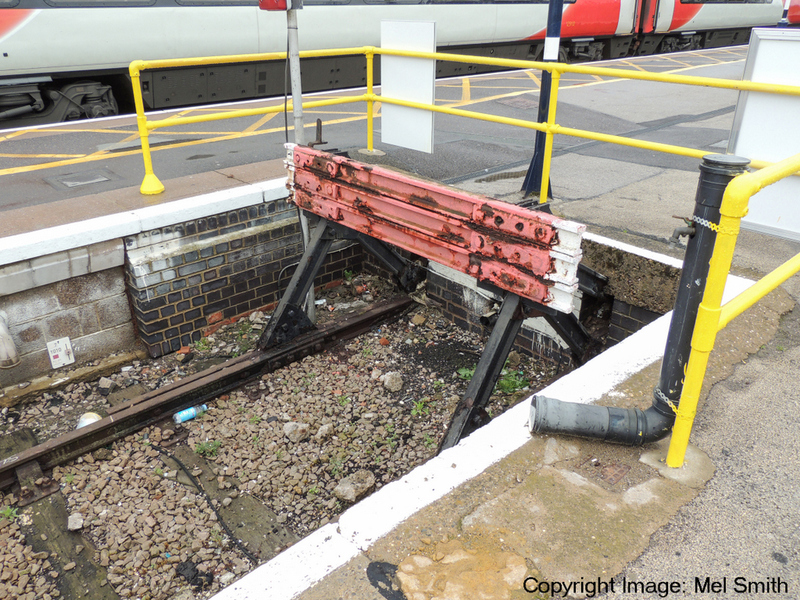 Please visit our 1970s B&W survey to see what this end of the platform looked prior to demolition. 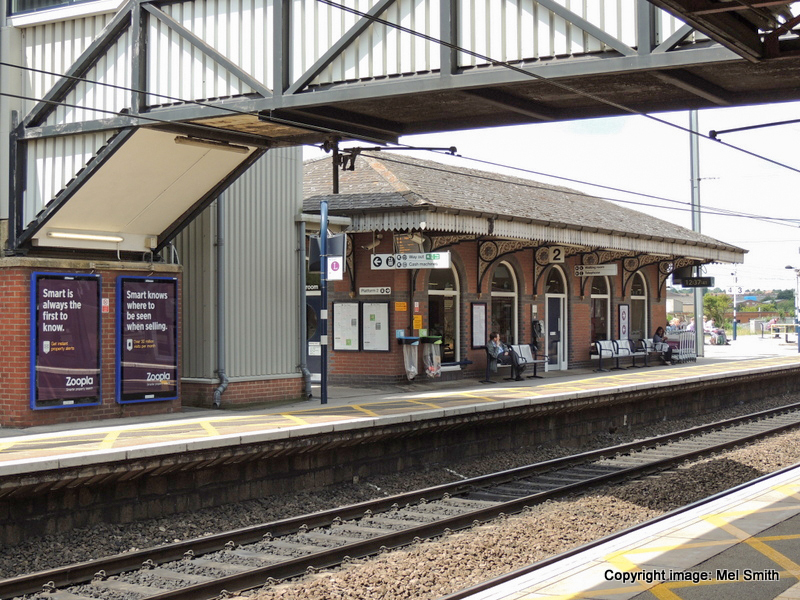 This is a view of the Waiting Room looking north along platform 4. Platform 3 (Bay) is just out of sight at the far end of the Waiting Room. 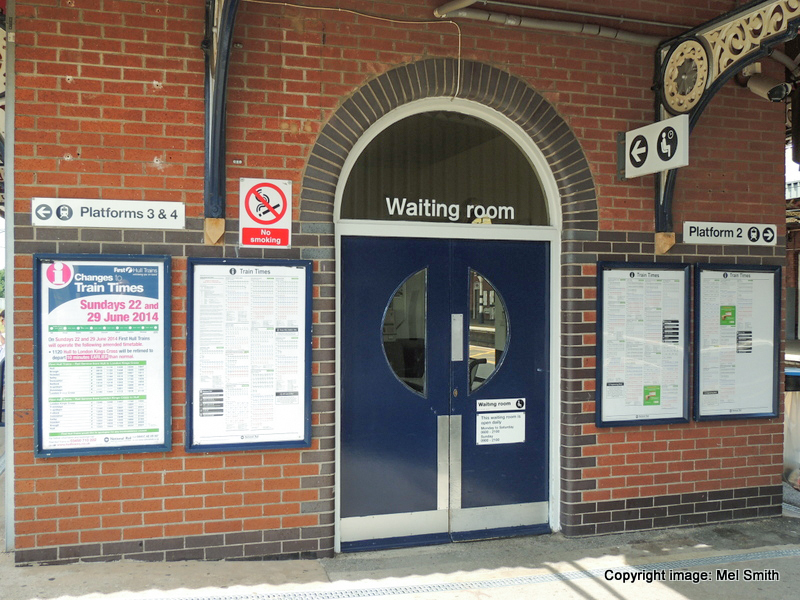 A closer view of the entrance doors situated at the south end of the Waiting Room. 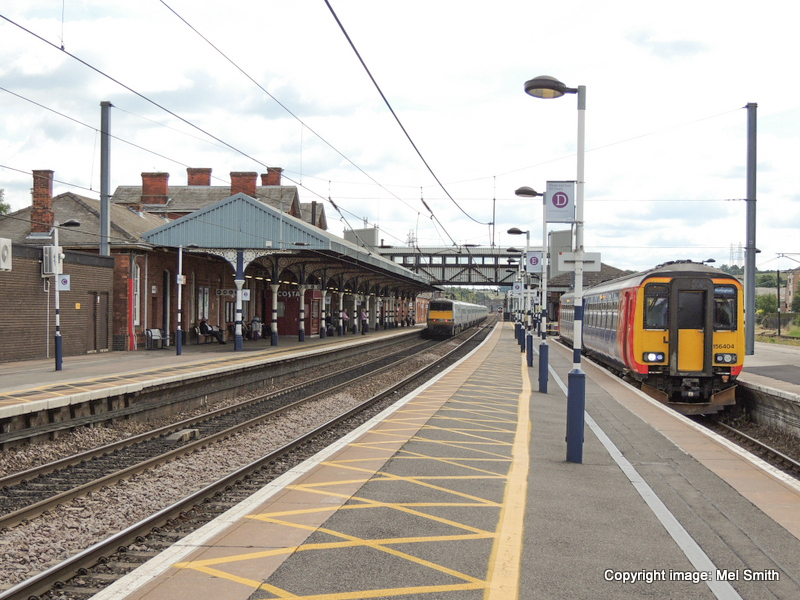 Platforms 3 & 4 to the left, platform 2 (main line) to the right. Still on platform 4 we turn around to look south and view the steps leading up to the footbridge, giving access over the main lines to platform 1 and the way out. 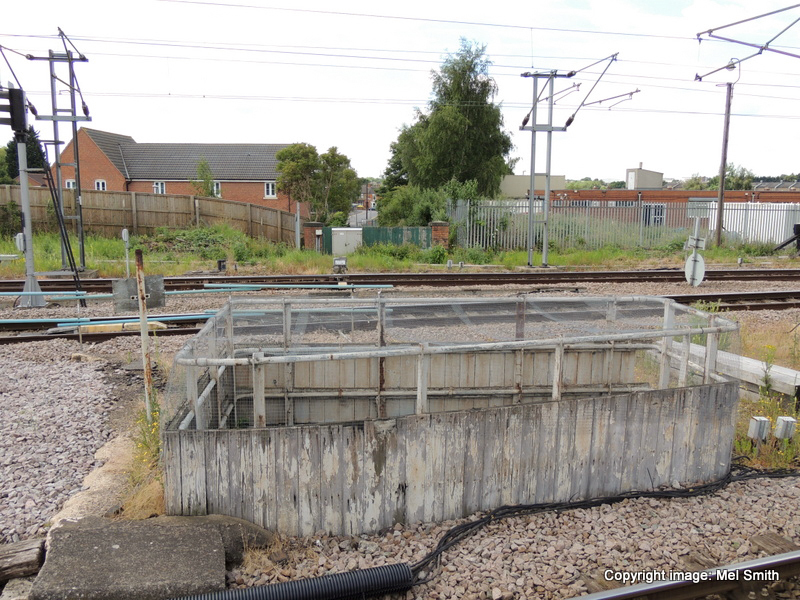 The corrugated structure on the far left houses a relatively new feature on this side, a lift to the footbridge. 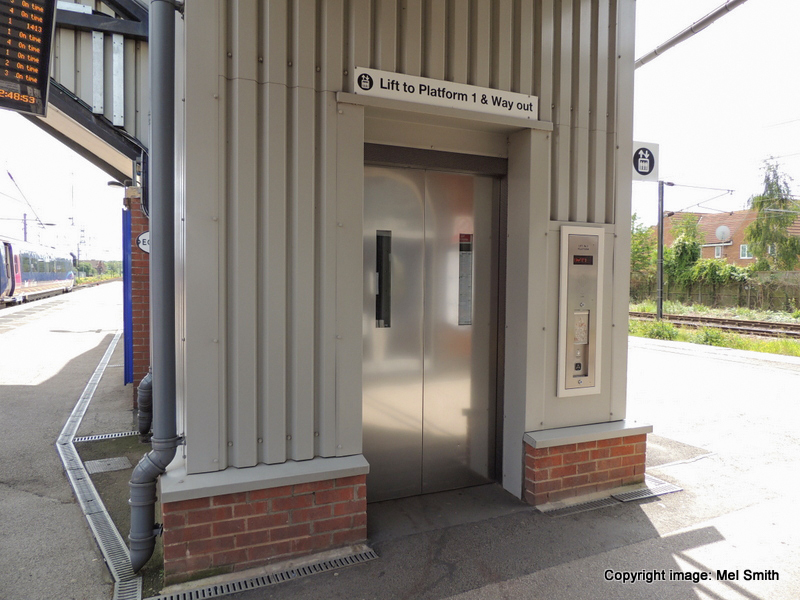 With platform 2 on the left and platform 4 on the right we take a look at the entrance doors providing access via the lift to the footbridge. Having taken the steps instead of the lift, we find ourselves on the footbridge looking back west towards platforms 3 & 4 below. Moving down the stairs from the footbridge we descend again to platform 4 and stop to take in another view to the south just past the Waiting Room. 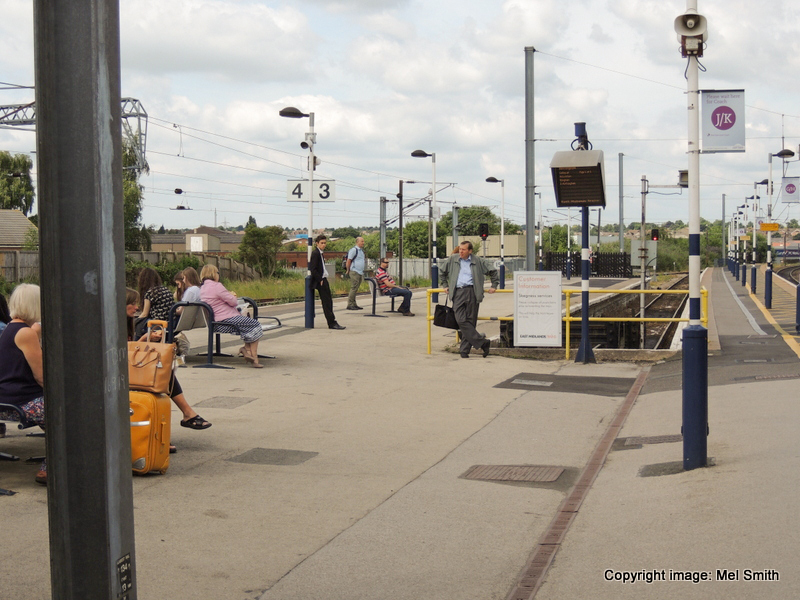 With the Waiting Room behind us this view looking north shows passengers in transit waiting on platform 4 on the left. 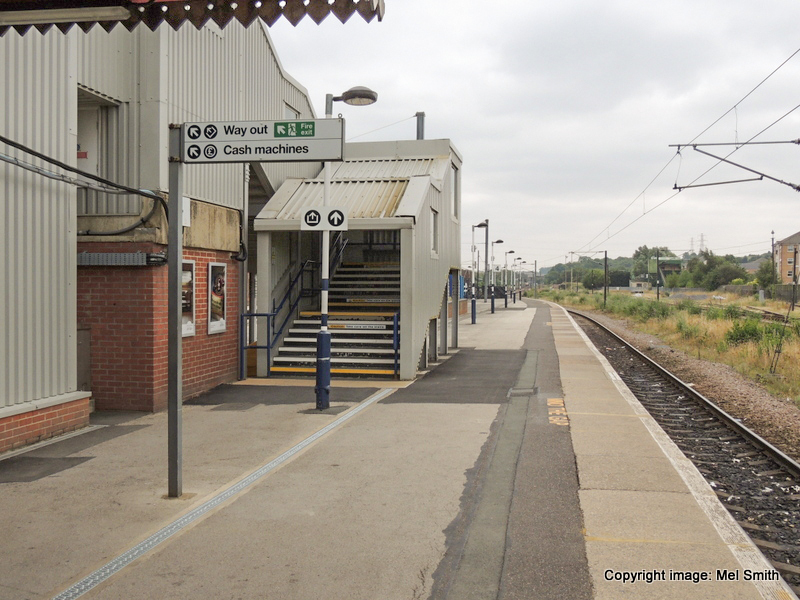 Platform 3 with its Bay is seen central, with part of the main line just visible on the right. The buffer stop in the Bay. 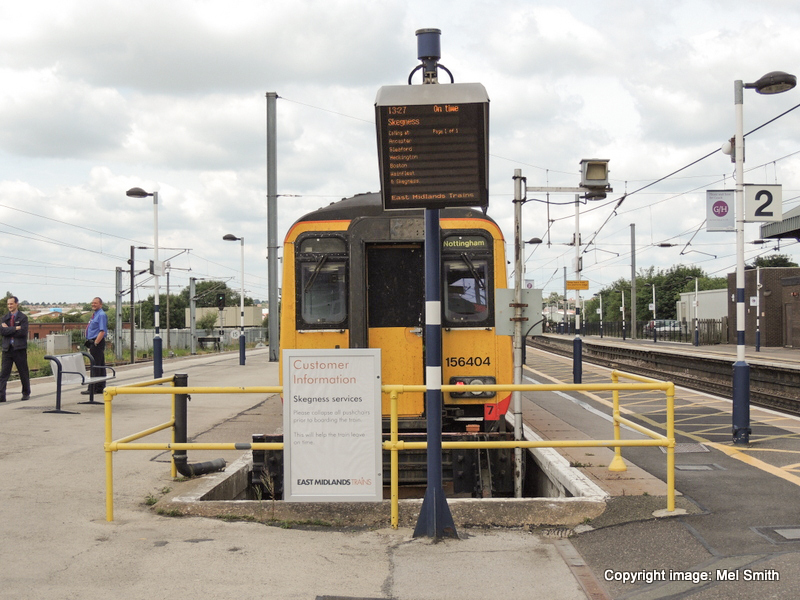 The buffer stop on platform 3 looking north. The entrance to the bay on platform 3 looking north west. 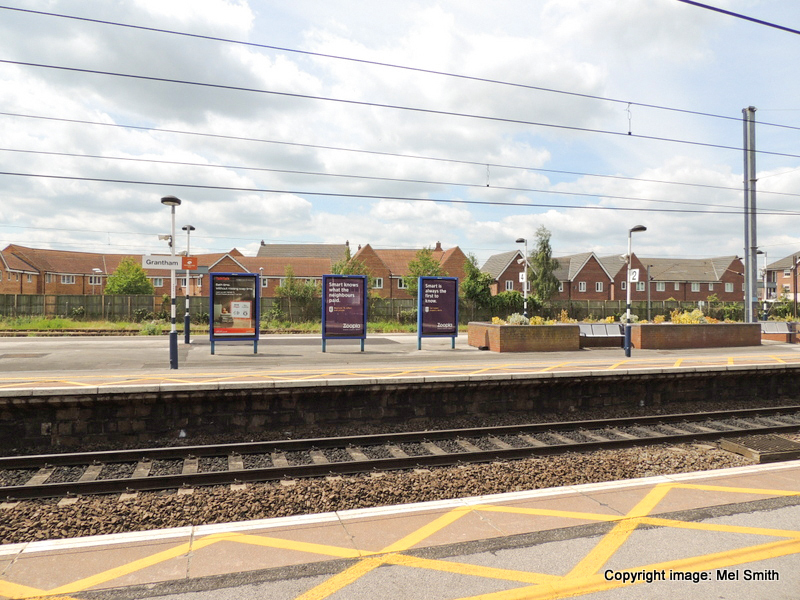 In the right middle distance we can see the familiar opening above the subway leading from Station Road to the Grantham Railway Club and Huntingtower Road. A closer view of the subway opening, now looking south west. The relatively new housing development in the background was built on the site of the loco shed. With the subway opening in the foreground this is a view looking west along the alignment of the subway under the tracks. Finally we arrive at our starting point at the north end of platform 2 with another view looking south. In the distance a London bound train departs from platform 1. In the bay a Nottingham train gets ready to leave.